Tuesday, 4th March 2014. Everyday there is something new to learn in the market. Likewise yesterday, there was no Buying interest once the market reached its multi-months high at 2,860. Other news to follow. "- The U.S. stock market fell sharply Monday as political tensions between Ukraine and Russia over the Crimean peninsula pushed investors to move into safe havens. Russia’s armed invasion over the weekend of the Ukraine over the weekend overshadowed several better-than-expected economic reports in the U.S. The S&P 500 index SPX -0.74% finished the day 14.02 points, or 0.8%, lower at 1,845.43, after closing at a record on Friday. The Dow Jones Industrial Average DJIA -0.94% was down as much as 250 points at session lows, but ended the day 153.68 points, or 0.9%, lower at 16,168.03. The losses in the blue-chips and large-caps were the worst in a month. The Nasdaq Composite COMP -0.72% lost 30.82 points, or 0.7%, to 4,277.30." "-Asian stocks bounced back in February, with most markets in the region reclaiming ground after a tough start to the year. The broad MSCI Asia ex Japan was up 2.6% for the month until Thursday, as stocks recovered from a selloff in January that was caused by a wide range of concerns over emerging markets, including China and Turkey. Although some issues remain in the emerging world, with political uncertainty in Ukraine and the recent sharp fall in the Chinese yuan, the worry in the markets appears to have abated. Australia was one of the strongest performers in February, with the S&P/ASX 200 up 4.6% since the end of January, wiping out the month’s 3% loss. Stocks in Sydney have followed U.S. markets higher, while a strong local reporting season has also helped sentiment. The market was on a tear in recent weeks, surging 8.1% from its low on February 5 to its peak on February 25, when it hit a more-than-five-year high. Hong Kong’s Hang Seng Index was 4.2% higher month-to-date after a 5.5% loss in January, while South Korea’s Kospi rose 1.9%. Japan’s Nikkei Stock Average, however, was flat for the month and down 8.4% year-to-date." "-Gold futures surged by more than 2% on Monday as the escalating crisis in the Ukraine spurred a flight to safe assets, lifting prices to their highest settlement since late October. Gold for April delivery GCJ4 +0.13% jumped $28.70, or 2.2%, to settle at $1,350.30 an ounce on the Comex division of the New York Mercantile Exchange. Prices marked their highest settlement since Oct. 28 based on the most-active contracts, FactSet data show. Earlier, prices had climbed to as high as $1,355." FCPO- Set Sail To North, With Some Caution. Not all expedition is traveled without any hazards or hurdles. Some obstacle and difficulties would come to any traders when they are sitting on a positions. For intrday traders, they would have to make decision more frequent and fast. It is part instinct and mostly discipline to due diligently follow your trade plan, period. We had some sort of rejection after the May contract surge to multi-months high at 2,860 level. Most of the Buying interest gradually diminished, as if would like Buyers had vanished for the rest of the session. You can obviously see a few lower highs and lower low candle action formed on five to 15 minutes chart yesterday, signifying weaker price formation but nothing serious. In the other hand, we are likely to see uptrend pause if the May contract continue to closed lower than 2,800 today. If this event materialize, this particular candle would look like "shooting start" candle if the market does closed lower for today session. 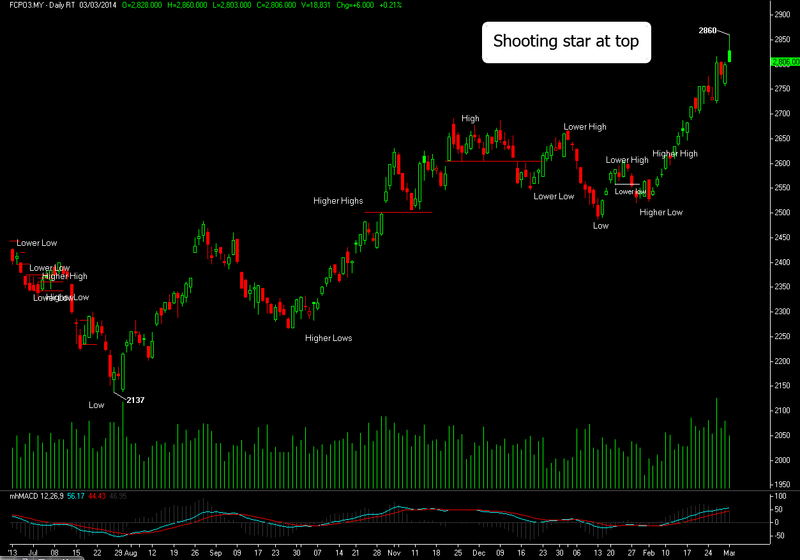 The Shooting Star candlestick formation is a significant bearish reversal candlestick pattern that mainly occurs at the top of uptrend.The Shooting formation is created when the open, low, and close are roughly the same price. Also, there is a long upper shadow, generally defined as at least twice the length of the real body. The long upper shadow is the proof that the Bears are able to off part of the Bullish force yesterday. One candle might serve as an indication, but if you add it up with today or few daily chart candles together, you will find a stern warning for further retracement if the session is closed weaker than the other day. For today, pivot support for the May contract is located around 2,786 while resistance is pegged at 2,880.